The new ChIP-exonuclease (ChIP-exo) Kit offers a highly optimized protocol for high-resolution genome-wide mapping of transcription factor binding sites. 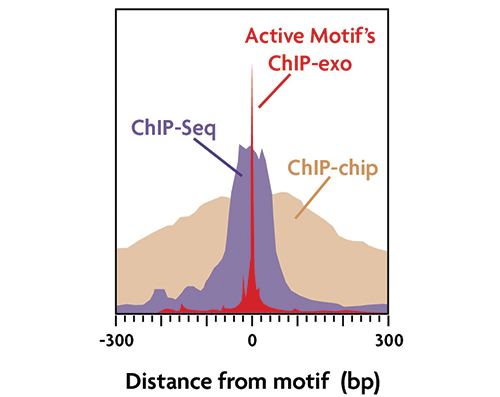 ChIP-exo is a modified ChIP-Seq approach that utilizes exonuclease digestion to reduce DNA fragments to the site of transcription factor binding prior to deep sequencing. The advantage of ChIP-exo is that it generates superior resolution of DNA binding protein maps by decreasing the number of reads mapping outside of peaks and increasing the accuracy of identification of protein-DNA binding motifs. With the ChIP-exo Kit, transcription factor binding site resolution is significantly improved, with ranges in length from 20–95 bp as compared to traditional ChIP-seq resolution of 200 bp or more. This allows researchers to more accurately generate genome-wide protein binding profiles to study mutation or SNP effects on transcription factor binding sites.